Sander does know how to make a good tune, remember his summer collab with teenager Julian Jordan for their track, ‘Kangaroo.’ This was followed in short order with the sweeping sounds and heavy drops of ‘To Galaxy,’ part of the remix soundtrack for hallowed video game franchise HALO . And then there was the signing of ‘Nothing Inside’ to Jay Z’s Roc Nation imprint back in October. 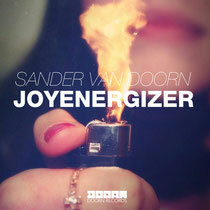 Now, as the finale for 2012, Sander offers up the mayhem of ‘Joyenergizer’, which is out Christmas Eve. The track is an intense sonic ride full of upward momentum and production maneuvers, a track that Sander dropped as his last track at EDC Las Vegas, causing the 50k strong main stage crowd to go completely bonkers. Check it out below. Sander’s latest tour continues tonight with an appearance at Mandarin Outside in Argentina.